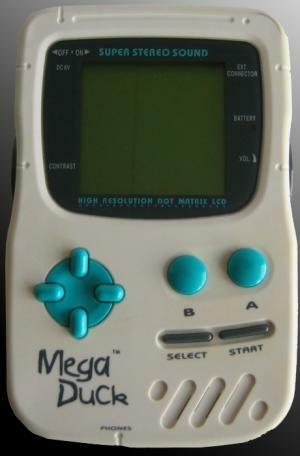 The Mega Duck (also known as Cougar Boy) is a handheld game console that was produced by Hong Kong-based Welback Holdings through its Timlex International division and came on the market in 1993. The cartridges are very similar to those of the Watara Supervision, but slightly narrower with fewer contacts (36 pins, whereas Supervision cartridges have 40). Conceptually, the electronics inside the Supervision and the Mega Duck are also very similar. The position of the volume controls, contrast controls, buttons, and connectors are virtually identical. However, the LCD of the Supervision is larger than the Mega Duck's. The Cougar Boy came with a 4-in-one game cartridge and a stereo earphone.